When we titled our campaign “See the Beauty,” we had to talk about what we meant by “beauty.” The idea isn’t universal. Cultures have different values of beauty and individuals have varying tastes. So what do we mean? One of the first things that often strikes people when they come to Micronesia is the landscape. As the plane banks for landing, you can see an oasis in a desert ocean out of your window; dry land sprouting green trees. As you move closer to the beach the water goes from deep blue to glistening teal and finally to frothy white. In the evenings, the fluffy clouds, often weighed down with warm rain glow create the most stunning sunsets you’ve ever seen. But is this the beauty we’re trying to encourage people to see? If so, the campaign would be a bit pointless; you can’t miss the sunsets. Maybe the next thing people notice is the children. Some days it rains so hard that the streets flood and taxis leave rooster tails of water behind them. Little boys come running out of their houses to skim board down the road with cardboard boxes. Is this what we mean? When we say beauty, we’re talking about something even broader. 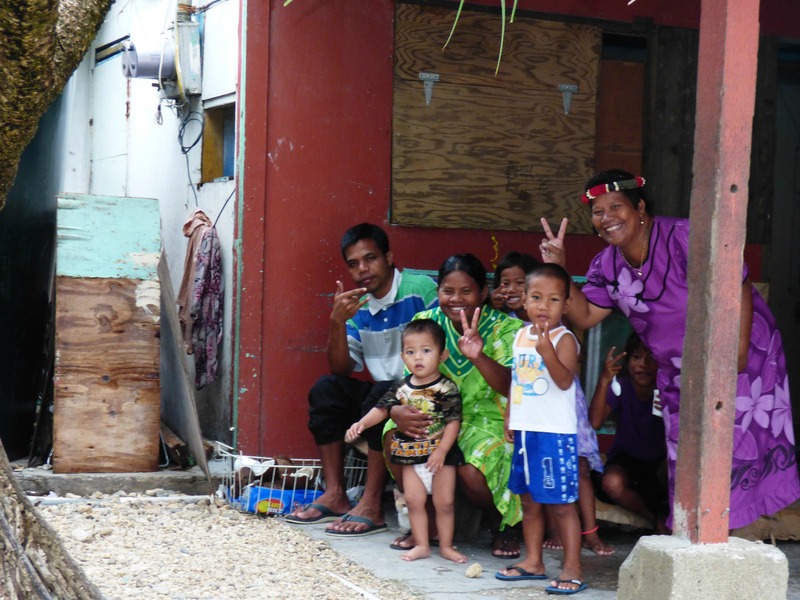 Yes, the landscapes are breathtaking and yes, the little kids will warm your heart, but when we say Micronesia is beautiful, we’re talking about Micronesia holistically. You can’t divide up beauty. It is not simply the mothers with their babies. It’s not just the enchanting voices that sing so joyfully in the churches. It’s not only the traditional canoes that show a great mastery of sailing and the mysteries of local navigation. It is all these things and more interwoven together. Working internationally is inherently difficult. In addition to political borders, alternate legal systems, and language barriers, transnational work has to account for difference in culture. This goes far beyond dress and diet. This seeps into the way we read emotions, the things we expect of people socially and business-wise, and the axioms we hold to be absolutely true. We must acknowledge that we come from particular backgrounds and bodies of knowledge. We must recognize that our culture differs from others, and that no culture or practice or form of knowledge is inherently better than another. A preference for Western “science-based” medicine over regional folk medicine, for example, naïvely discounts social merit, placebo effects, and affordability. And to be honest, many folk treatments are doubtless physiologically better for a body than the refined chemicals and pills Western medicine is so fond of prescribing. This purblind perspective also overlooks the fact that countries that practice Western medicine still have strong traditions of folk medicine—they just may not be named as such. Local knowledge and wisdom is invaluable in getting the job done. After all, it stems from a specific and relevant history and context. Systems and plans that work in one state may be impractical or even harmful in another. Understanding this not only sidesteps certain misplaced superiorities, but it can lead to the acceptance and use of a particular country’s knowledge. It’s a broad, sweeping goal, but we strive to validate the cultures and wisdom of the people we work with. One of the most common excuses for exploitative media plays on a vague idea of honesty. Why did you photograph a kid playing in garbage when if viewed from another direction, he was playing by the ocean? Well, because that’s really where he was. It’s true. Why do we talk about someone’s problems or use words like “needy”? One might argue it’s honest. They really do need something or they really do have this disease. This idea of honesty seems to be a bit lacking. Each of us comes to what we do with a bias. Our teams arrive on island with an image of what they expect to see. This bias will almost always come through in the language we use and the images we present. Because of this, when we say we’re honest, we are often just unconsciously showing our bias. It is very, very difficult to escape a bias; some might even argue that it is impossible. That’s why we’re not asking for people to come as blank canvases. Instead, we think your bias should be one of showing respect and noticing beauty. When you work with people, expect to see something beautiful. Expect to be blown away and to learn something new. We’re not striving to simply portray “honest” content. We want to be respectful. We want to see beauty. Most nonprofit organizations focus their work on a specific problem: poverty, illiteracy, some kind of disease, etc. This is a great way to focus efforts and expertise in an efficient way, but this also makes it possible for individuals and organizations to fall into the trap of identifying people solely by a certain issue. For instance, it can be easy and convenient to think of people as “cancer patients” or “diabetics” (or perhaps as is now used, “people with diabetes”), as though their diseases are their unique attributes, or they will cease to be of concern once they reach a level of health. Though a disease is often greatly significant in one’s life, to reduce a person to a solitary issue is to ignore the richness and complexity of that individual. This kind of perspective can also lead to an “us vs. them” mentality, creating greater disparities between people groups despite good intentions. The divide between “people in need of medical treatment” and the people providing medical treatment can, without careful critical thought, easily shift to “poor people” and people who take a plane ride to leave the situation after two weeks. Thinking of cultures not our own as “other” is natural, and probably impossible to avoid; it’s when this “other-izing” is combined with a sense of superiority that we find ourselves in danger. Even the oft-heard quote of “we have so much to learn from them,” becomes a patronizing cliché, as though it is surprising that other cultures are valuable. “Realizing” a culture’s value often results in romanticizing it, including its struggles. I have often heard people recently returned from their travels, expounding on their epiphanies: “They have so little, but they’re so happy” (often followed by a vow to either better appreciate their affluence, or “live simply” with less material possessions). While this perspective is, in a way, positive, it again comes from a bias of superiority, simplifies a culture to single issues, and allows for a false sense of cultural understanding. Rather than reducing people and cultures simply to what we think is important or sensational, we strive to view communities as a whole. Finally, fields like nonprofit work and international development are brimming with idealists wanting to change the world for the better. The noble drive for a healthier, safer, and more equitable planet is great: lofty goals actually lead to progress. Unfortunately, the business of helping others is sometimes soured by an ambient hubris. Thinking you’re better than others is counter to bettering the world. Working for an NGO does not mean your job is more important than your friends’, even if they work for “dirty capitalist” superstores. (Also, good luck finding funding for your work and salary without that dirty capitalism.) In the same way, doing development work overseas does not make you better than the people you’re helping. We believe this is true no matter your skin color, language, or level of education. We’re not perfect, but we try to approach our work with the knowledge that we are in no way superior to those we work with, among, under, or over. We don’t measure social value according to the number of Facebook-posted selfies with children in other countries. We’re just people trying to do our small part for humanity. At the risk of sounding hubristic, we encourage others to take this stance as well.